The last 2 components for TFC Hercules - Neck Breaker (Bonecrusher) and Mad Blender (Mixmaster) - were released just before Lunar New Year. I'm glad to have gotten them and to finally assemble Hercules aka Devastator! Group shot with three Decepticon combiners, all enhanced by 3rd-party companies. 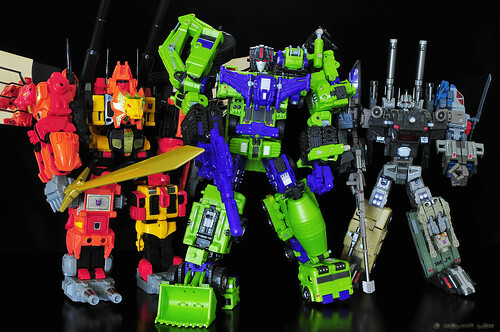 In fact, Devastator is completely made by a 3rd-party company! I waited a long time to finally recreate this scene from the '86 movie! So is TFC Hercules worth it? Each component bot is equivalent to Voyager class, but cost almost 3 times more. I'll also probably spend a bit more on Reprolabels to enhance this big boy further. Still, I have no regrets about getting this. 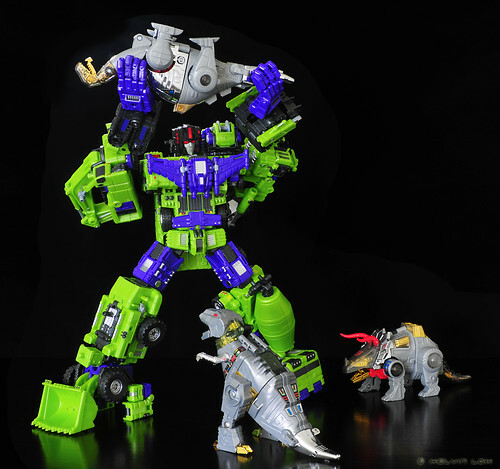 You just have to assemble them up to form Devastator to see why he commands such high price.